To undertake a major voyage. Following the successful dip in the North Sea at Bridlington our attention turned towards a voyage of some significant sort. The English Channel is the obvious choice but the Irish Sea had move appeal. A quick study of the map revealed a promising possibility; Whitehead in N. Ireland to Portpatrick in Scotland. The dramatic Murroch Bay was initially chosen as the landing or departing site but unfortunately a site visit revealed a difficult rocky shoreline risking damage to the propeller and floats. 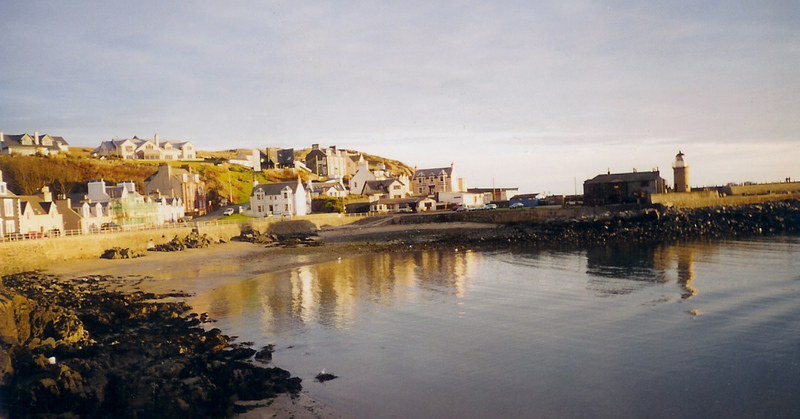 Portpatrick harbour (the film location for "2000 acres of Skye") proved ideal - an attractive harbour with a sandy beach within a sheltered bay area accessed by a good wide slipway. There was also public parking within 50m in which we could assemble the craft. A short trip over to Belfast revealed Whitehead to have a good easy access slipway and also a lockup compound to store equipment and vehicles. On the face of it the route looked good. The next task was to find a local boat for support and to glean as much as we could about sea conditions and currents. We arranged to meet a local skipper, Mike Wood who runs fishing trips aboard the Silverline from Portpatrick. Mike gave me a good grilling about the suitability of the vessel we had built for the crossing before committing to supporting us. After three hours and a few pints we shook hands on a proposed venture. 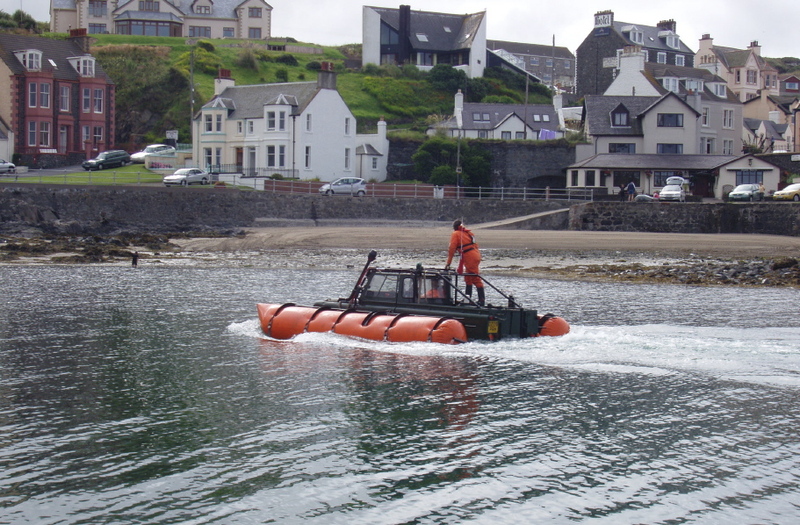 Mike recommended going from Donaghadee to Portpatrick taking into account time, tides, currents and ferry traffic. Crossing the sea in that direction we would tackle the most difficult currents (the Ram Harry Races) at the beginning of our crossing rather than at the end. A quick call to Down & Antrim Council offices told me there was a private marina at Donaghadee called Copeland Marina run by Gerry Nicholas. Gerry it turned out was full of enthusiasm for the project and as helpful and accommodating as he could possibly be. He not only offered the use of his marina and yard but also provided his own boat to accommodate us prior to departure. A date was agreed of the 26th July 2004. 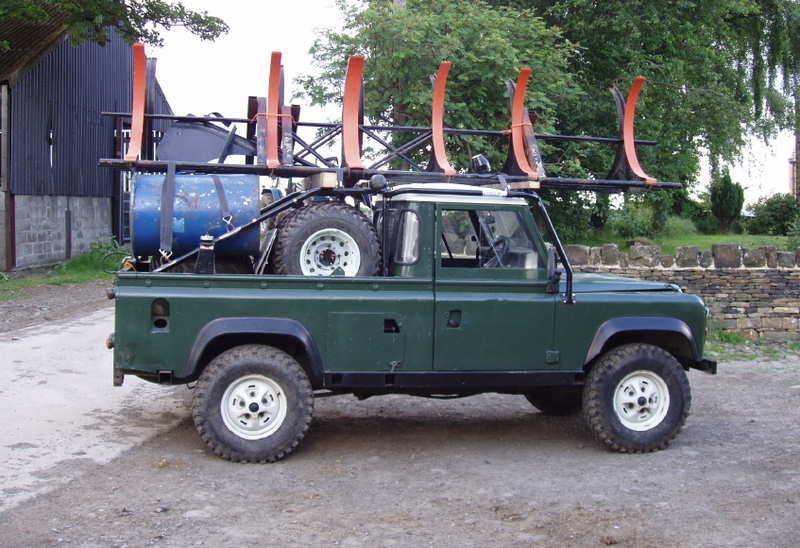 The landrover was driven to Donaghadee via the ferry from Stranraer prior to the crossing and assembled in Gerry's yard for safe storage. On the night of the 25th July we boarded the Silverline in Portpatrick bound for Ireland. The crossing was quite choppy but Mike was confident the turning tide would kill the swell before morning. The weather forecast was perfect and the tide dictated a 5am departure. It took till midnight on arrival to assemble, check and double check everything. The slipway we were going to use was a mile from Gerry's yard across Donaghadee town centre. 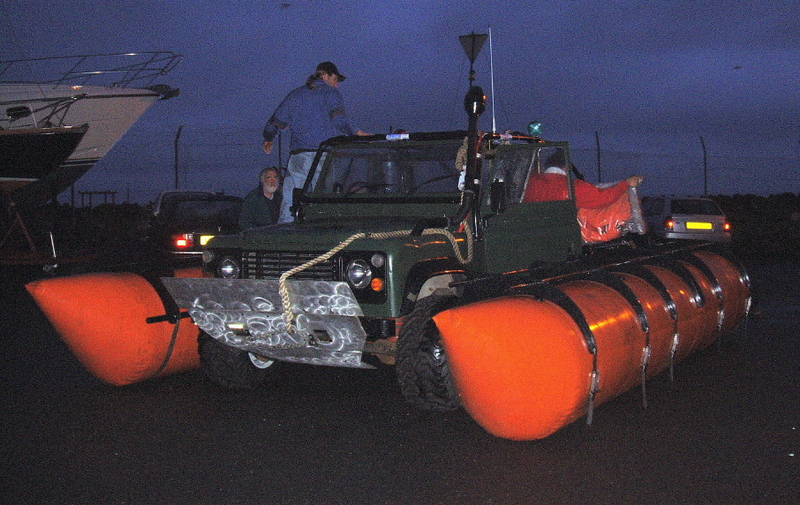 Gerry had no doubts about driving a 16ft amphibious landrover the wrong way down a one way system - not at 4.30am anyway ! We sat on the slipway, said our thanks and goodbyes, called Mike on the radio and drove into the Irish Sea. All seemed well. Mike had been right - the sea was flat as a mill pond. It was just getting light and Foreland Point lighthouse was winking at us from out of the gloom. At some point roundabout now I tried mentally to adopt marine terminology; the lighthouse was "to port", Donaghadee was "astern", Copeland Island was "dead ahead" and the Silverline was "to starboard". It dawned on me that Mike and I had never discussed how the voyage would commence - would I follow my compass bearing and he follow me or would he set off in front and I follow him? I was happy either way but I needed to know in the next few moments or we would collide !!! Evasive action was necessary; I threw the joystick to port, the landrover slewed round and an embarrassing mishap was averted. The pressure relief valve was whining at me but I was so relieved to miss Mike's boat that I never noticed and hung onto control. Next thing a toothed belt does what a toothed belt does best and grips when you wish it would slip. The inevitable occurred. I radioed our "Houston .... we have a problem" moment to Mike and we came to a standstill within sight of the shore !! We did have spares and tools on board to cover most eventualities so five minutes later we were on our way again. But not before I agreed with Mike that I would follow him !! It wasn't the first time I had been at sea by any means but the first time I had been in control and responsible for my own vessel and it was very different. Temperature, swell, current and colour of the sea are constantly changing and every change has an effect on a vessel so small as ours. 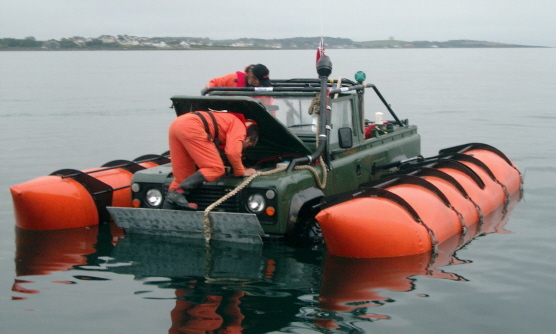 The landrover is either bobbing up and down, rolling, drifting on a current, speeding up or slowing down. The GPS watching our every move. As Copeland Island slowly disappeared from view the sun came out but failed to generate much heat. 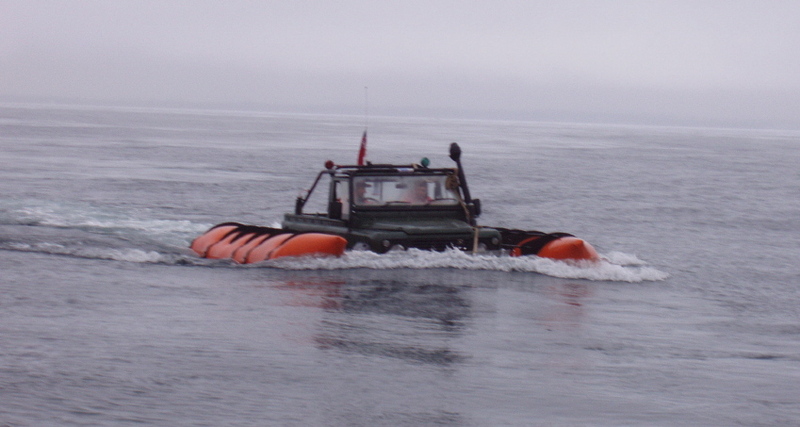 The landrover was running very comfortably at about 4.5 knots. Dan who had been in the back keeping an eye on things climbed into the cab out of the cool wind. Four hours later and the Scottish coast clearly visible I had been following the GPS which would lead us into Portpatrick harbour but Mike was slipping away south. Surely he wasn't going the wrong way? By now I could see Portpatrick lighthouse ahead. Mike had now stopped - a garbled radio communication followed (the external speaker I had fitted to rectify the Bridlington problem was full of water). I guessed I should follow him. Portpatrick was getting further away which was a bit alarming but we had caught up with Mike and were pushing on. Quite suddenly the landrover was caught by a current and swirled round to starboard 45°. I now realized why we were so far off course - we would approach the harbour mouth on a different bearing and let the current do some of the work. A 3 knot current had quite a profound effect; it only lasted about fifteen minutes and let go of us as we approached the mouth of the harbour. Mike had now stopped in the small bay area but well away from our landing area and all aboard were watching us. I engaged drive to the wheels and inched towards the beach waiting for the first bump as the wheels touched terra firma. As soon as the wheels found traction in the soft sand I raised the floats to transfer more weight to the drive wheels. We lurched forwards and to cheers and applause from supporters and bemused crowd of onlookers we drove onto the beach five hours after leaving Donaghadee. The landrover had performed perfectly. We dismantled, washed some salt from the engine and drove back to Yorkshire. The prototype felt well and truly proven.